I don't find this particularly professional. Thanks for the feedback, Ced. Which part is unprofessional? I assume you're not talking about t-shirts being unprofessional attire (we’re allowed to wear them at my office). Do you think what testers do should be hidden from the users or are you worried about offending the devs? My devs were cool enough to see the humor in it and called me “1109” for a while. We kid each other all the time. That’s what makes our jobs fun. And the truth is, when we went to prod, us testers may not have written the bits that shipped. But we sure did contribute in a significant way. I think it's great! Great idea!!! I may do something like this with my team. I think depiction of the number on the tee sounds a touch crude. "The world is divided into people who do things--and people who get the credit. HEY BUT I AM BOTH!!" for the tester do-er, hard-working, with all the positives. And there could be others for finding the most number of critical severe defects, fewest 'cancelled', tester who grasped the domain fastest, tester who went beyond the test cases (in the strict process-centric environment primarily driven by test cases - unlikely, not recommended but probable) & so on..
Eric, I regard absolute bug counts as horribly misleading as there are so many bugs that are not entered into the tracking system and so many bugs that are not relevant to really count (spelling errors and the like). 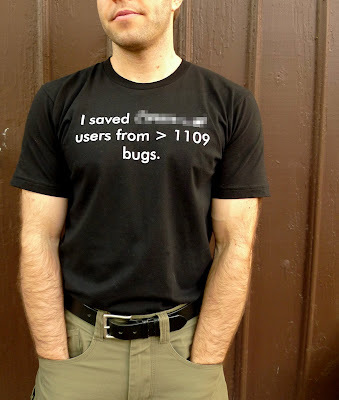 Displaying the amount of bugs on a shirt is just terribly wrong in my eyes, I'd rather be proud about a successful release and have a party together with all the developers, sales people, account managers, marketing staff and bosses instead of boosting some obscure, irrelevant statistics on a t-shirt.